Well, when it rains it pours in the world of the NASA Earth Observatory - and this week we've been treated to three great images of volcanoes or volcanic landscapes from space. I thought I'd spotlight them and add some of my thoughts of the images. 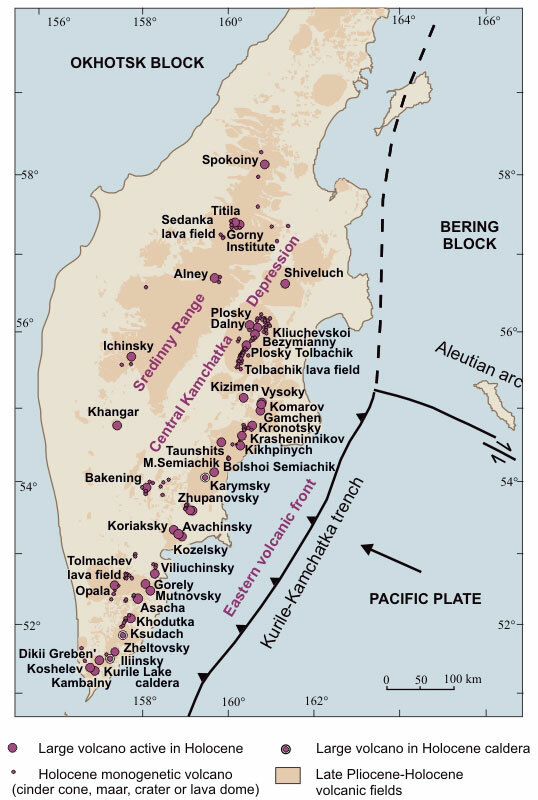 Two images came from the ever-active Kamchatka Peninsula. The first shows a fairly weak but steady plume from Karymsky on October 8, 2010. The ground is fairly snow-free (being the end of the summer season) so the air that has fallen doesn't stand out as it does on some Kamchatka images, but you can still see some grey on the ground surface around the volcano. If you look at the larger version of the image, you can see a bunch of the volcanoes on the peninsula - starting from the south you can see the snow-covered peaks of Avanchinsky, Koryaksky, then Zhupanovsky, then the crater lake of the Akademia Nauk caldera. After reaching Karymsky with the plume, you can see Semiachik, Bolshoi Semiachik and finally the cone of Kikhpinych at the edge of the image. Another image from Russia captures the current explosive and effusive activity at Kliuchevskoi. The image, captured on October 11, shows a steady ash plume from the volcano and thermal ASTER images bring out the thin lava flows moving down the western flank of the edifice. Taking a look at the larger version of the image, you can zoom in on Kliuchevskoi and see the ash - almost radially distributed around the volcano, either due to changing winds or fallout from a larger plinian column (not uncommon at Kliuchevskoi). The drainages coming off the volcano to the east look like they might be full of volcanic ash/mud from the volcano as well. This larger image is fascinating for a number of reasons as well - if you zoom out, you'll see Kliuchevskoi to the bottom and Shiveluch to the north (along with Bezymianny to the bottom left of Kliuchevskoi). Both are snow covered, and Shiveluch has a prominent ash deposit on its southern flank - I'm not sure if it from ash fall or flow, but some of it seems to follow valleys, making me think it could be some flows (UPDATE: Apparently these are the 1964 eruption deposits - thanks to R Simmon for that clarification - see comments below). In between, there are lowlands that show a lot of glacial-produced terraines (kames and kettles), along with what looks like a tuff cone. Now, I've tried digging around for a name for this feature near the town of Klyuchi, but haven't had much luck - any guesses or better Kamchatka geography knowledge than I can do? The NASA EO also posted another in an amazing set of images of the area near Mount St. Helens in Washington. This set covers the evolution of the landscape around the volcano from prior to the 1980 eruption until the present, covering now 31 years. In these images, you can really see how the area has been revegetated - and quite quickly - and how long the trees in Spirit Lake (middle-right of the image) have survived. They cluster in different parts of lake, but there is still a significant portion of the lake filled with the downed tree trunks from the 1980 eruption. You can also see how little the 2004-2008 dome growth added to the edifice at this scale. The new dome shows up between the 2004 and 2005 image as a little new bump inside the crater - these dome episodes are likely how the volcano will heal the explosion crater over thousands to hundreds of thousands of years. Top left: Mt. Saint Helens in the fall of 2004, one day before the first explosions of the 2004-2008 dome growth.